Wherever machinery operates there will be seals of some kind ensuring that the machine remains lubricated, the fluid being pumped does not leak, or the gas does not enter the atmosphere. Seals are ubiquitous, in industry, the home, transport and many other places. 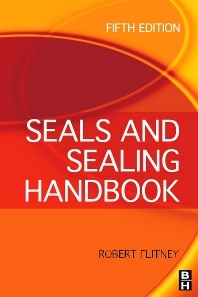 This 5th edition of a long-established title covers all types of seal by application: static, rotary, reciprocating etc. The book bears little resemblance to its predecessors, and Robert Flitney has re-planned and re-written every aspect of the subject. No engineer, designer or manufacturer of seals can afford to be without this unique resource. Designers, manufacturers and end-users of seals throughout the following industries: pumps, motors, piping, filtration, oil, gas, water, process industries, hydraulic, pneumatic, marine, automotive and power generation. Plant and maintenance engineers, specifiers, consultants. Robert Flitney is a Chartered Mechanical Engineer in the UK and a Member of the Institution of Mechanical Engineers. His early engineering experience involved the operation and maintenance of power and process plants in the marine and frozen food industries. This was followed by 35 years of contract R&D on Fluid Sealing Technology at BHR Group, including 10 years managing this activity. He has authored or co-authored over 50 papers, presented at international conferences, has been invited to provide the keynote presentation at Sealing Seminars, and was Convenor of the ISO Working Group responsible for reciprocating seal test standards. His current activities include consultancy and training on seals and sealing technology, and he is Technical Editor of Sealing Technology, a monthly newsletter for industry.